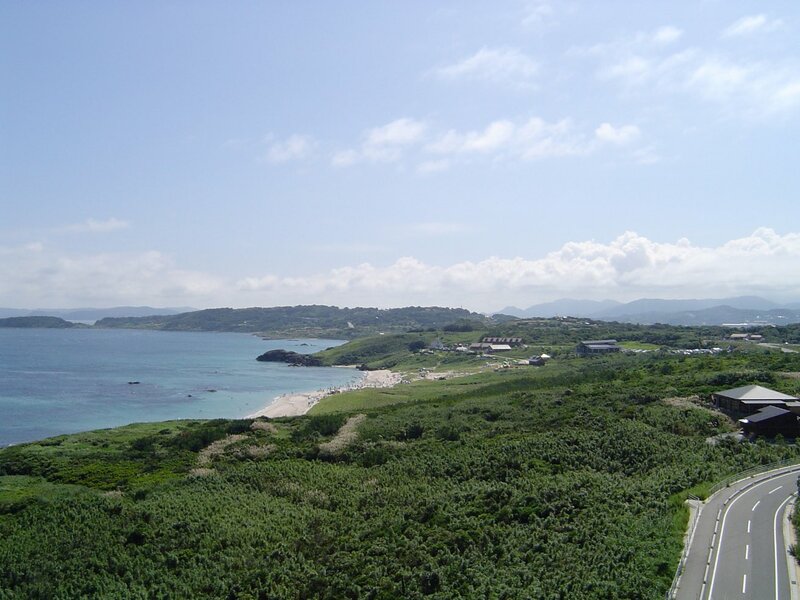 Tsunoshima (角島) is a scenic island and important ocean navigation point in the Sea of Japan (East Sea) off the northwest end of Honshu in Yamaguchi Prefecture. Literally, the name of this barbell shaped island means "Horn Island." The shape of the island is reminiscent of the horns of the Japanese cows that have been farmed here since ancient times. 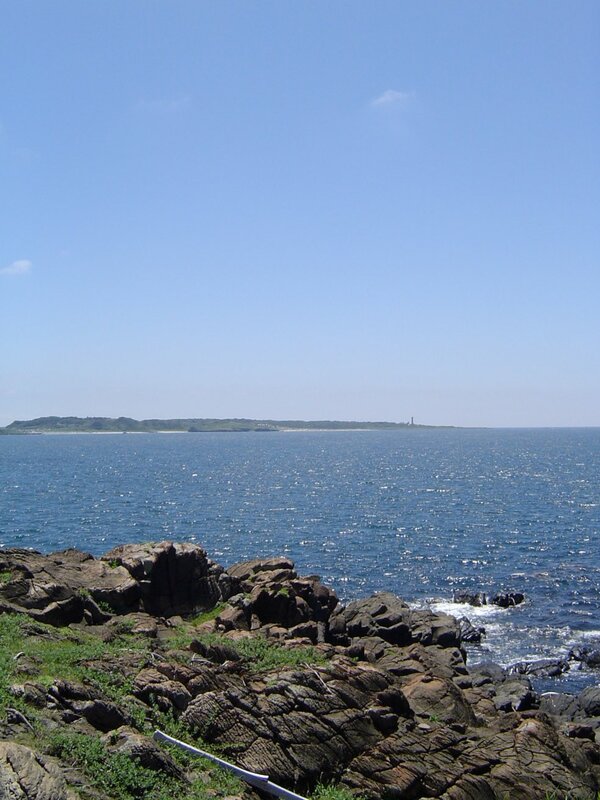 Tsunoshima Lighthouse on the island's western horn was the first modern lighthouse built on the Sea of Japan. The opposite end arcs out into a stunning grassy point that, for the eye, seems to float in the middle of the ocean. The area is a popular location to shoot movies and shows. The island was formerly part of Houhoku Town (豊北町) and is now part of the area that Shimonoseki City administers. The island is 4.1 km² and 17.1 km in circumference. 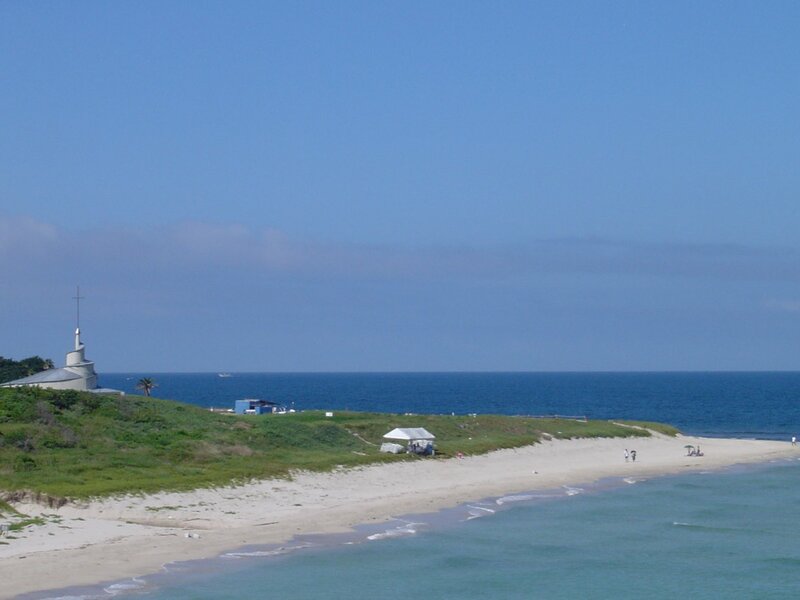 Many people come to the island to view the ocean scenery, camp and swim. 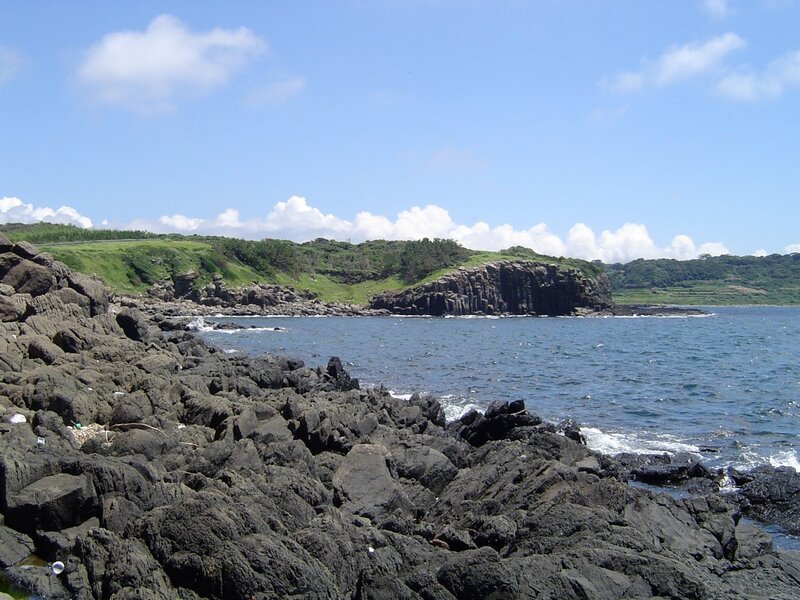 In 1997, the entire island was incorporated into the Kitanagato Coastal National Park. 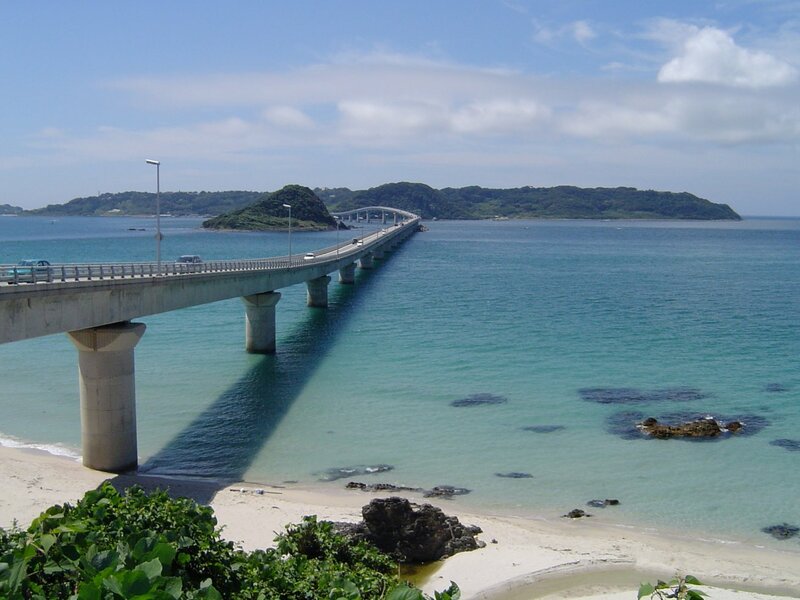 The 1,780 meter long bridge to Tsunoshima (角島大橋) from Houhoku Town crosses over the shallow emerald ocean and brilliant white sand that separates the island from Honshu. It was the longest toll free bridge in Japan from it was completed on November 3rd, 2000 until a longer bridge (1,960 meters) opened in Okinawa in 2005. Pictures of the bridge's graceful sweeping lines harmonizing with the scenery are something every tourist takes home with them. Tsunoshima Lighthouse (角島燈台) was first lit up on March 1, 1876. It was the last of 26 lighthouses that were designed and built in Japan under the supervision of British engineer Richard Henry Burton (1841 - 1901). He arrived in 1868 at the start of the Meiji period as a foreign expert and left in 1876 with the title of "Father of Japanese Lighthouses." 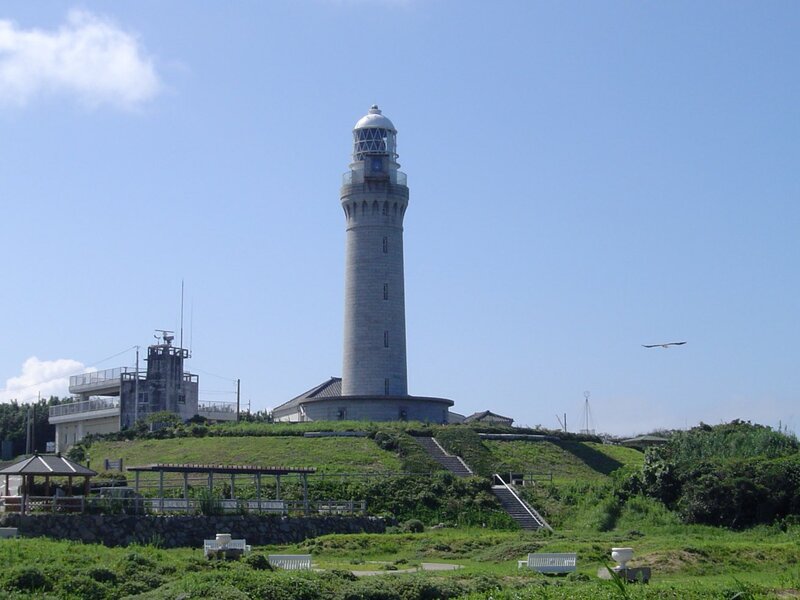 His 43 meter stone lighthouse on Tsunoshima has guided ships along the coast coming to and from the Kanmon Straights in Shimonoseki ever since. Beside the lighthouse is a small museum built in the former light keeper’s house. It's 150 yen for adults to see the displays about the history of Japanese lighthouses and tour the first brick house in Yamaguchi Prefecture. The lighthouse can also be climbed and the brave can enjoy the brisk ocean breeze on the balcony. 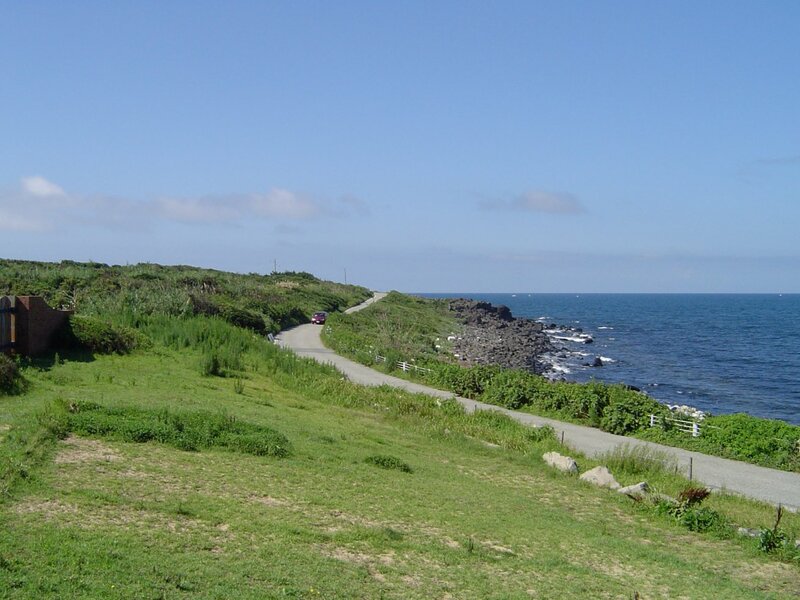 Yume Point (夢ヶ崎) where the lighthouse stands is part of a park. 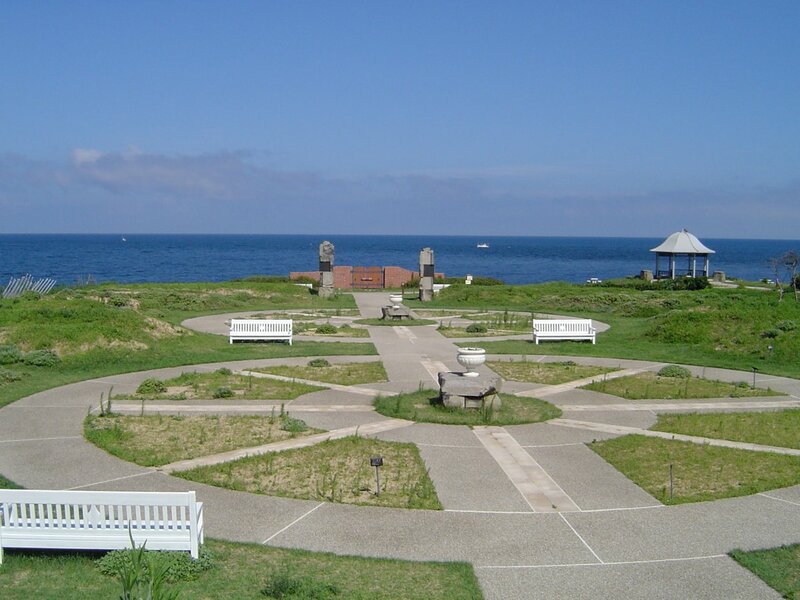 A large flower garden is spread out under the lighthouse and paths lead off next to the coast. A gate to the ocean symbolically marks the island as the entrance for many ships into the Sea of Japan. Fairly expensive pay parking is available. The beach that you reach a bit before the lighthouse is quite popular during the summer. There's free parking but you'll pay per head to swim. Usage of the showers is included with the beach ticket. 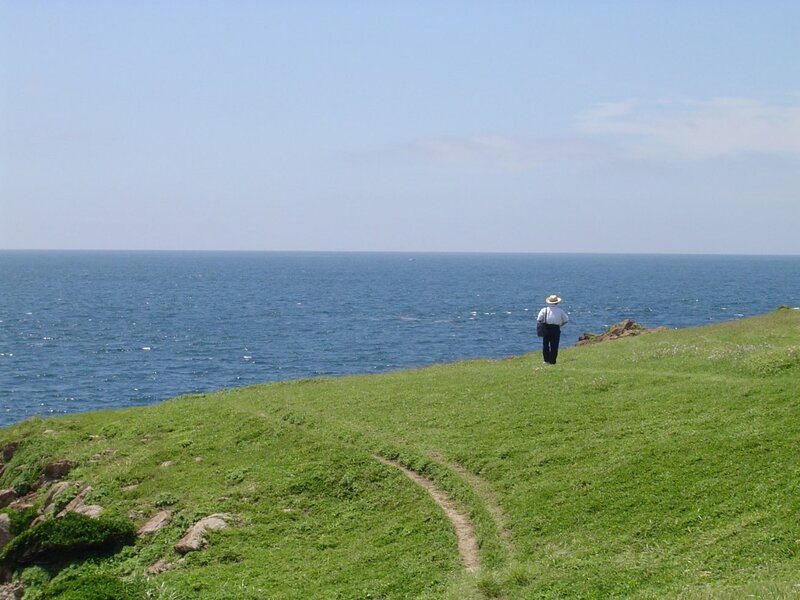 Makizaki Point (牧崎) is the northeastern end of Tsunoshima and one of the most beautiful parts of the island. 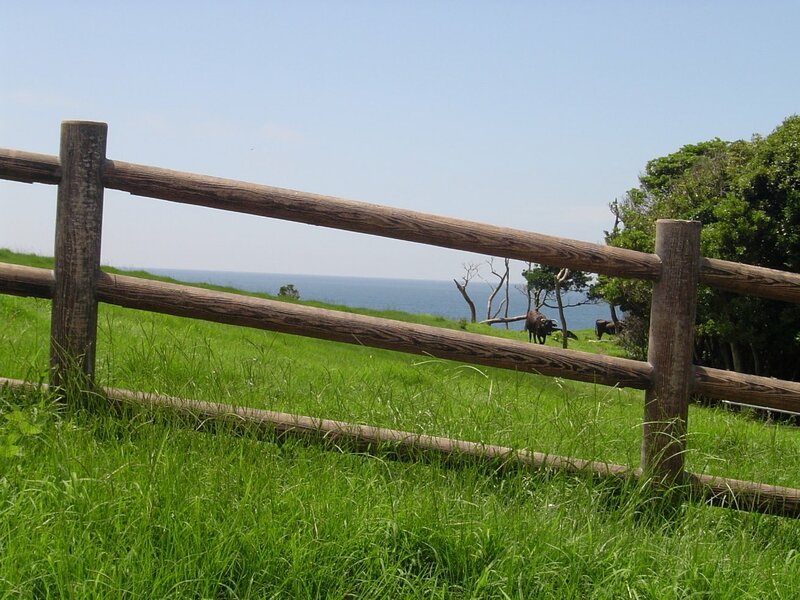 This grassy knoll is home to a small herd of Japanese cattle. 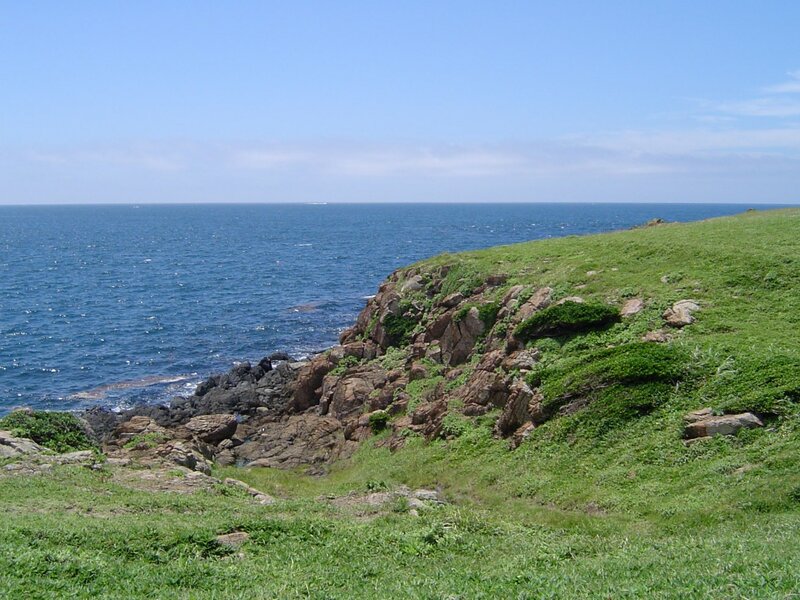 Actually, the name means pasture point in English and cows have been kept on the island since the Nara Period (710-794). The walk down to end of the point leaves you surrounded by the ocean on all sides. The route to the point is poorly marked so take a map with you. 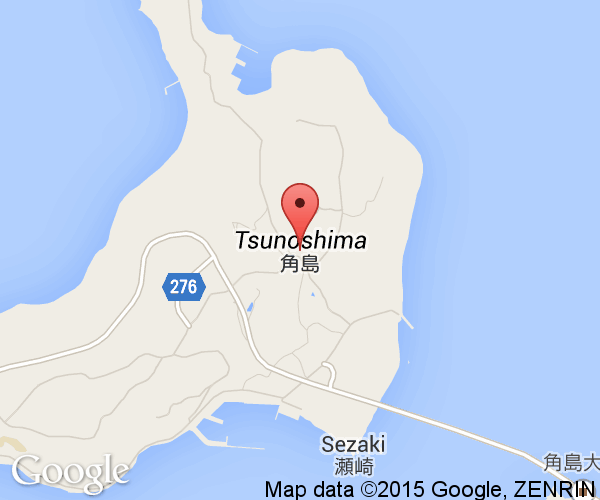 Tsunoshima is best reached by and explored by car. It is quite out of the way. There are no expressways to the island but the highways to Shimonoseki and to the east across Honshu are quite good. It will take around 60 minutes to reach the island from Mine IC which is closest exit off the expressway system. The northwest corner of Yamaguchi Prefecture has a numerous natural onsens (and ryokans) that are worth visiting as well. Coming by bus and train is another option but is fairly expensive. Buses run by Blue Line Koutsu go to Tsunoshima from JR Kotti and JR Takibe Stations. From the former, its a 20 minute bus ride to the bridge.